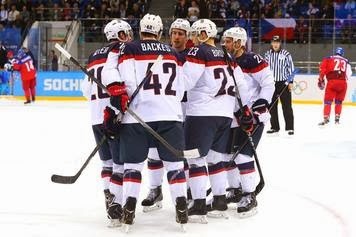 Sochi, Russia -- James van Riemsdyk, Dustin Brown and David Backes tallied in a three-goal first period, as the United States put 32 years of frustration to rest and gained a spot in the semifinals thanks to a 5-2 decision over the Czech Republic on Wednesday. Zach Parise and Phil Kessel also lit the lamp for the Americans, who hadn't beaten the Czechs -- or its previous incarnation as Czechoslovakia -- in Olympic play since 1980 and will face Canada in a Friday semifinal. "This was certainly one I think we all wanted and possibility looked to," U.S. head coach Dan Bylsma said. "You don't want to get ahead of yourself. We knew we were going to have some big games prior to this point in time, but you were looking forward to the possibility of this rematch and now we have it in the semifinals. I know our group and our guys are ready for it and looking forward to it. We certainly had to win some hockey games and do well before this point, but now we have the rematch with the Canadians." The defending gold medalist Canadians squeaked past Latvia, 2-1, on a late power-play marker from Shea Weber. Their path through the USA got a little bit tougher when it was revealed after the game that Joh Tavares will not play for the remainder of the tournament after suffering a left knee injury. Ryan Suter added three assists and Ryan Kesler picked up two more helpers to back a 21-save effort by Jonathan Quick. Ales Hemsky recorded both scores for the Czechs, who came up short in their quest to medal for the first time since taking bronze in Torino eight years prior. Starter Ondrej Pavelec was pulled early in the second period after yielding four goals on 12 shots. Alexander Salak finished up with 12 stops. Van Riemsdyk measured Pavelec from the goal line to the right of his net just 1:39 after the drop of the puck, but Hemsky was credited with the tying score on a scramble in front at 4:31. Pavelec was rescued by his post on a Kessel drive minutes later, but the iron was no reinforcement after Brown was left alone at the left side to accept a Backes pass and score into a half-open net to make it 2-1 for the USA at 14:38. "There’s a lot of talented guys on this team and I’m on it too," Backes said when asked if it was tough for him to crack the scoreboard despite his team's Olympic-best output. Backes sent the Americans to intermission with a 3-1 edge, scoring just ahead of the buzzer by taking a Ryan Suter miss that caromed off the back boards and tucking it home from the right side. "That goal was the biggest difference in the game," Czech forward Jakub Voracek said of that crucial marker. "There's two seconds to go in the period, we have to make sure we lock it up." The end boards factored into the USA's fourth goal of the contest, as Joe Pavelski's point blast went wide, but Parise alertly followed up with a chance from the goal line off the carom at 9:31. Kessel sped to the net and tapped in a long Ryan Kesler cross-ice feed to make it 5-1 for the USA and officially welcome Salak to the game just after the two-minute mark of the third. Quick was finally beaten again on a blistering drive from Hemsky from between the circles with seven minutes to play, but the seasoned Czechs had nothing left for a comeback. Friday's other semifinal features a rematch of the 2006 title game, with Sweden and Finland battling for supremacy. The Swedes took down Slovenia, 5-0, while the Finns banished host Russia with a 3-1 decision.